Security Central offers Alarm Monitoring as one of our primary services to help protect lives and property in homes and businesses. 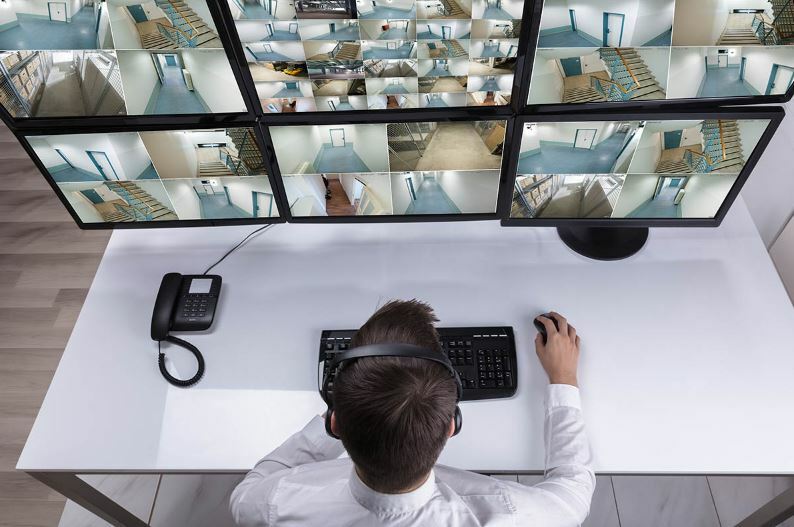 Popularized and glamorized in Hollywood TV shows & movies, alarm monitoring has changed dramatically in the last few years, producing much better results than the classic security guard sitting in front of a wall of televisions with a doughnut and spilled coffee. Security tools like video cameras and motion sensors have improved drastically to help improve false alarm rates, and deliver reliable, loss-prevention tools. Now, artificial intelligence and integrated technology can do the majority of monitoring work. Technological advancements have made it possible to remove on-site security guards and people watching a wall of tv monitors. That form of security monitoring is ineffective and is riddled with the potential for human error. Now, security cameras can be directly integrated with additional security devices, and the alarm monitoring center to provide direct alerts when an alarm is triggered. For example, if a burglar opens a door and trips a motion or door sensor, the camera can activate and send a video feed directly to an operator who can then make calls to police and property owners. Click here to see an example of Security Central’s AlarmView service being used to successfully apprehend an intruder. Improvements in alarm management process have helped ensure consistent, meaningful responses. Now, you don’t have to worry if the person protecting your home is distracted, watching the big game on a portable television. Instead, our alarm monitoring operators are on call 24/7, continually handling alarms, helping protect the lives and properties of tens of thousands of people, instead of just a single location. What does the monitoring process look like? Of course, it depends on the type of alarm that comes through, and the events that a device is looking for. As an example, fire alarms are different from security alarm protocols because of how response times influence the outcomes and benefits. Nowadays, most low-priority alarms can be handled by delivering electronic notifications to the system owner. If a battery gets low, for example, a simple text will let the owner know that it needs to be replaced. A high-priority, on the other hand, like a detected fire or intrusion, will require an operator response, reaching out to police and property owners alike to inform them of the situation at hand, and allow them to respond accordingly.